Concessions in forest areas consist of logging concessions and timber concessions. Industrial Plantation Forest (HTI) is an attempt to enhance the potential of plantations and forest quality by applying silvicultural production in accordance with the tread of (one or more silvicultural systems) in order to meet the needs of industrial raw materials and non-timber forest products timber. HTI Development Goals, among others: (1) Increasing the productivity of production forests, in order to meet the raw material needs of the timber industry and the provision of business fields (economic growth / pro-growth), employment (pro-job), the economic empowerment of forest communities (pro-poor) and the improvement of environmental quality (pro-enviroment), (2) to encourage the competitiveness of the timber industry (sawmills, plywood, pulp & paper, furniture, etc.) for domestic consumption and export. Area used for timber plantation is area in zonation as production forest with nonproductive (Regulation No. 7 of 1990, Article 5, paragraph 1), then the region is not in the forest area which has burdened the right of pre-existing (PP No. 6 1999, chapter 13). Two of these are used as a reference basis for determining areas that could be designated as an area of ​​industrial timber estates. Core tree diameter> 20 cm, less than 25 stems / ha. Parent trees <10 stems / ha. Lack of natural regeneration, namely: nursery <1000 stems / ha, and or saplings <240 stems / ha, and or pole <75 stems / ha. No data about non-productive area inside the production forest zonation at the Department of Forestry WebGIS. In practice it is difficult to determine the non-productive forest area because it required detailed inventory at each location. In practice delineation only for concession area only based on forest function and by considering existing permits. Determination of area for timber concession should be done with extreme caution, because timber plantation (HTI) the system allows the concession owner to cut down all area and replace with a particular production plant. If the region is converted into plantation areas important for the conservation of biodiversity will be lost in it. Another thing that should be considered is the aspect in which the timber industry as a management area should be supported by the results of the processing plant/mills and transport aspects of the market. Detail spatial analysis with consider biodiversity aspects, accessibility and industrial aspect need to be conducted to proposed more suitable area for timber plantation sitting. 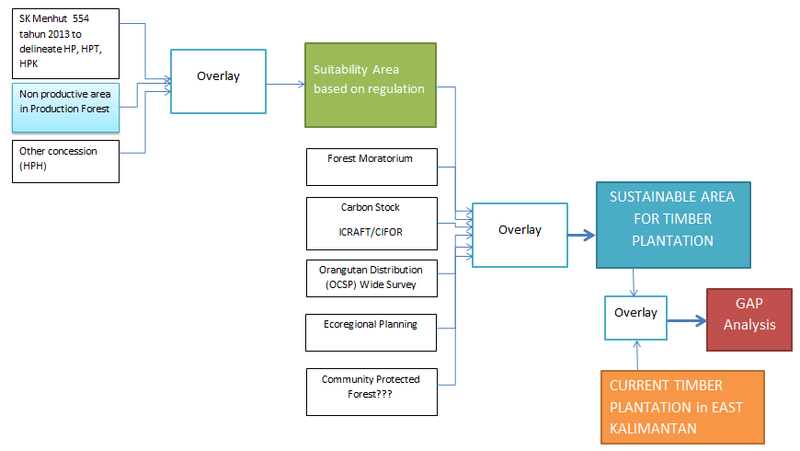 Timber plantation and other forest extractive concession need to consider data such as orangutan habitat distribution, ecoregional planning maps, carbon stock maps, also other aspects such as accessibility, mills location. 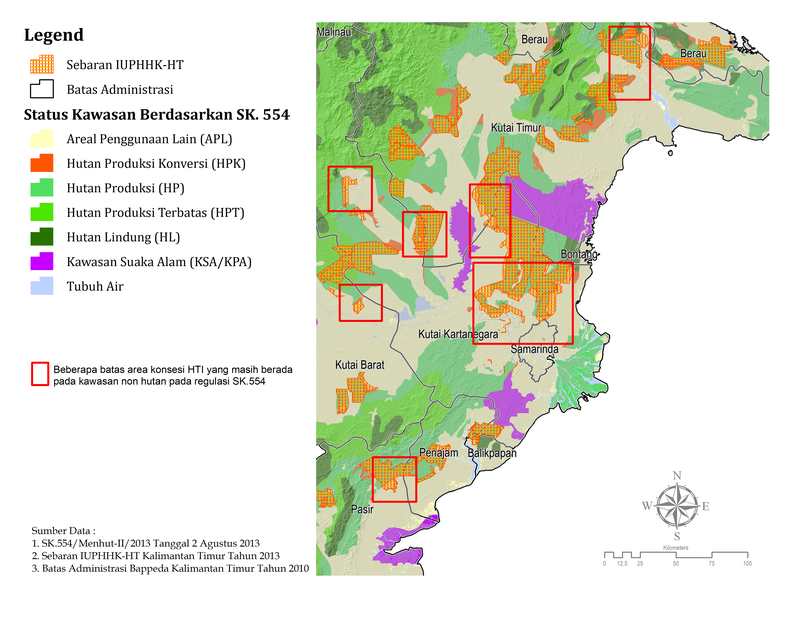 Ministry of Forestry recently in October 2013 released policy through SK Menhut no 5040 about indicative maps of production forest with no concession. 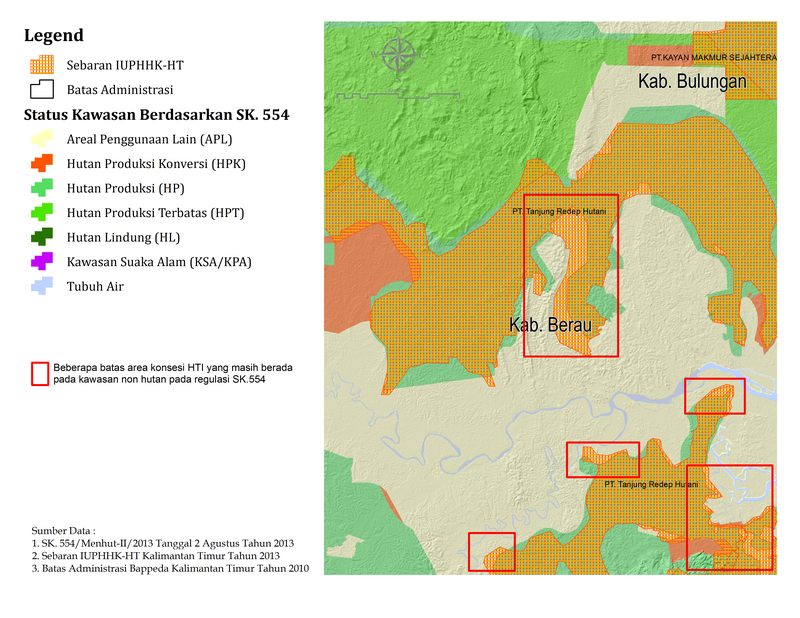 These areas used as based for HTI concession permit proposal by private sector in forestry. 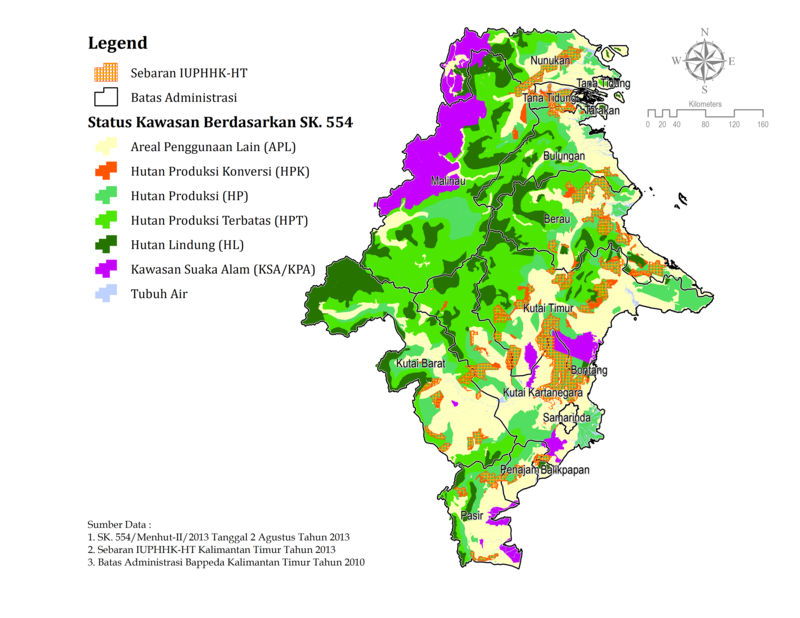 In Indonesia 14,579,246 hectare are of production forest with no concession and 5,953,271 ha area allocated for HTI. 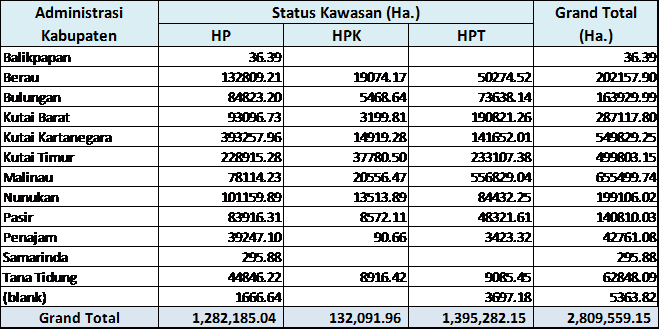 In East Kalimantan about 1,2 million hectare production forest with no concession and 537,719 ha for logging concession, 181,437 ha for rehabilitation concession and 548,719 for HTI and small area 31,198 ha for community forest. 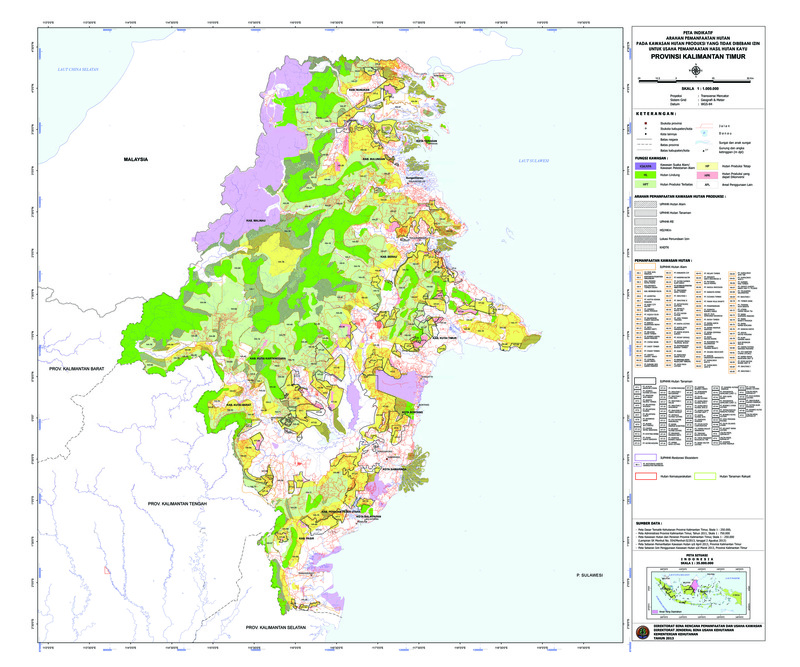 Maps for east Kalimantan shown below. TNC develop this analysis to highlight importance of conservation aspect for consideration, area for concession should not only based on forest designation area and physical condition. 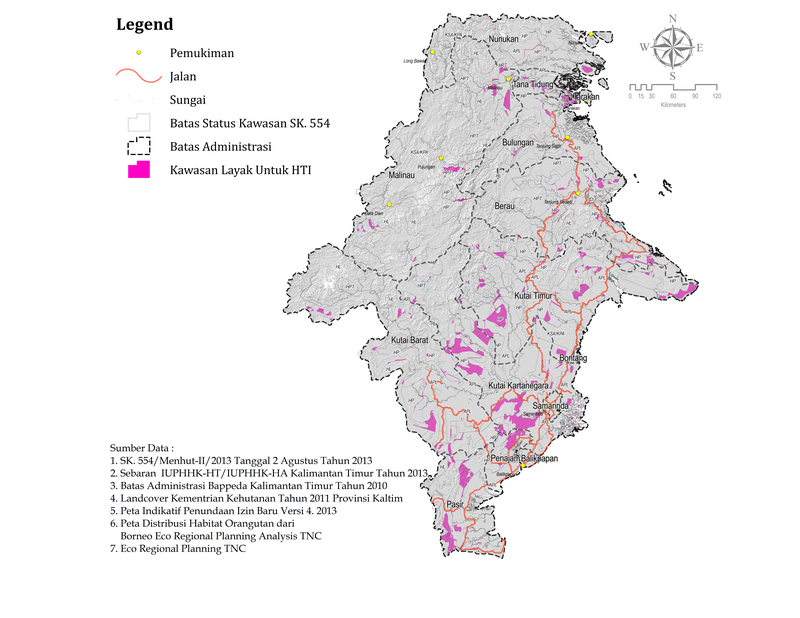 Spatial analysis will give updated situation about timber plantation (HTI) situation in East Kalimantan province by displayed recent concession areas and display further development plan for concession. The purpose of this analysis is to provide a picture that forest conversion also taking into account the conservation aspects in it. With the description of this analysis are expected to determine the signs are more selective and rigorous to determine which areas can be given permission HTI. The analysis was conducted based on the regulation of the forest area that can be used for the location of HTI. The area recommended for production forest plantations is unproductive and no other concessions therein. Then conducted further analysis to incorporate aspects of conservation aspect for consideration in determining areas that could be used for timber concessions. Official figures from the Department of Forestry for data HTI concessions, logging concessions, land-based Minister of Forestry Decree No. 554, Moratorium map. 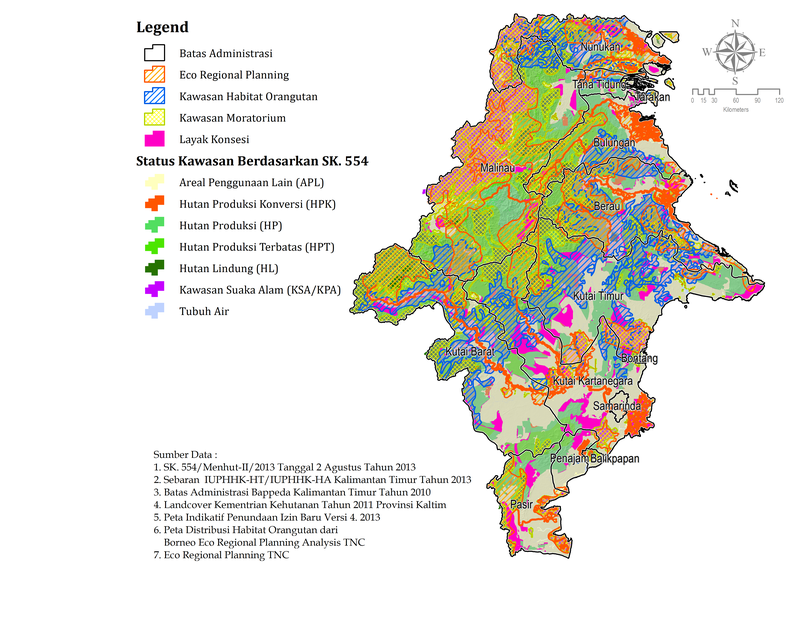 TNC data for the location and the orangutan habitat and ERP (Eco-regional Planning) analytical results for the East Kalimantan published in 2006. 4. Calculate area using calculation tools in ArcGIS. The results of the analysis showed that there were some concessions in East Kalimantan plantations that still exist outside of the production forest area as mandated in the regulations. Nonetheless size HTI concession areas located outside the area of ​​production forests are usually small and scattered in several locations. On the map can be seen some recent concessions plotted on a map of Forest Area by Decree 554 of 2013 found in some non- forest areas or cultivated area / APL . 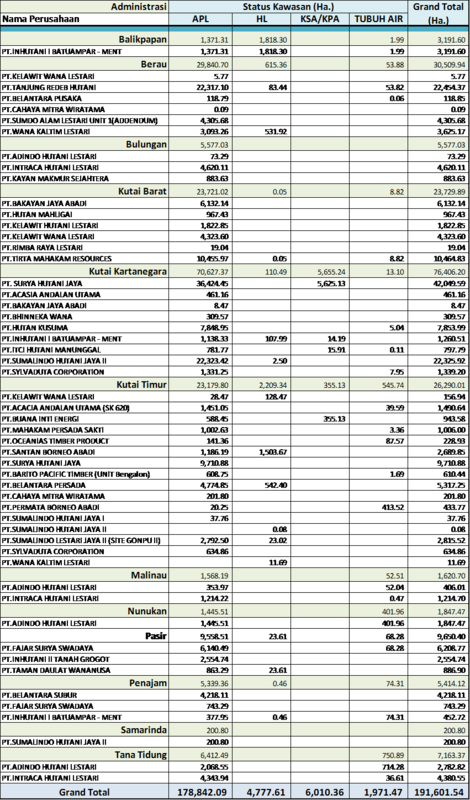 Distribution of timber concessions in the area of ​​non- forest / APL contained in the Kutai Kertanegara , Kutai Timur, Kutai Barat, Paser and Penajam. HTI concession that goes to non-forest areas in the region are small in size APL usually occurs because of differences or differences in scale base map , but there is also a timber concession in non- forest areas of APL in a significant area . The difference in base map, which maps are used to map the SK554 is a 1:250,000 and scale map of the HTI concession proposal develop at 1:25,000 scale. Data concessions that have not been updated, where several HTI has conducted detailed measurements for RKT/ annual plan then has received approval area. About 191,601.54 hectare total area of ​​timber plantation concessions that still must be considered to be improved and adapted to the SK 554. Table below show detail about HTI concessions outside production forest. The next process to be overlaid between Forest Area by Minister of Forestry Decree 554 with HPH and HTI concessions, which is based on the regulation stated that the area could be used as a concession area of ​​production forest is not burdened by the other license. Permit is in production forest concession there is also the forest. Overlay results can be seen in the following map. 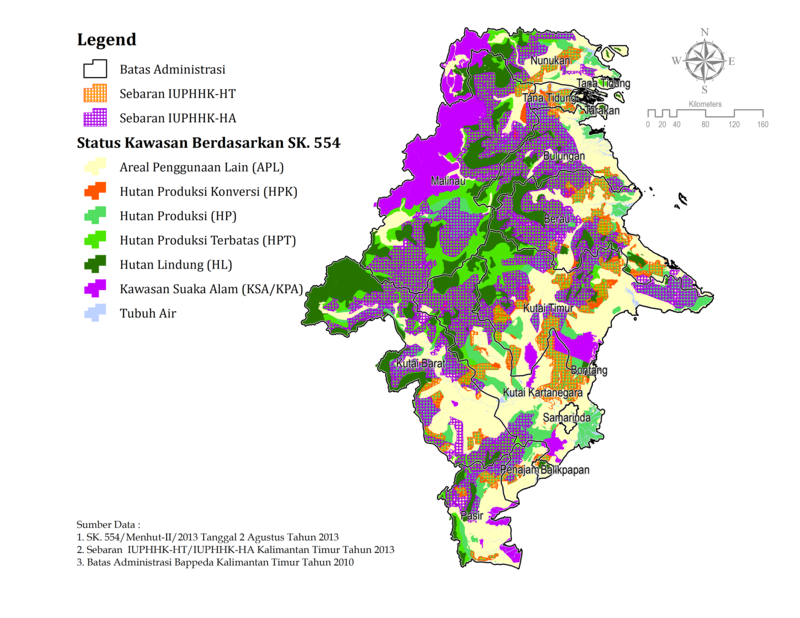 From the results of this analysis will be visible area based regulation can still be converted to plantations or other concessions such as logging concessions. The thing to remember is this area has not seen or aspects of other layers into consideration in determining the concession such as land cover, physiographic conditions, accessibility and conservation. In determining the appropriate location HTI concessions must be juxtaposed with the priority conservation areas and other considerations regarding accessibility, factors supporting industries such as mills and other activities outside the forestry sector. 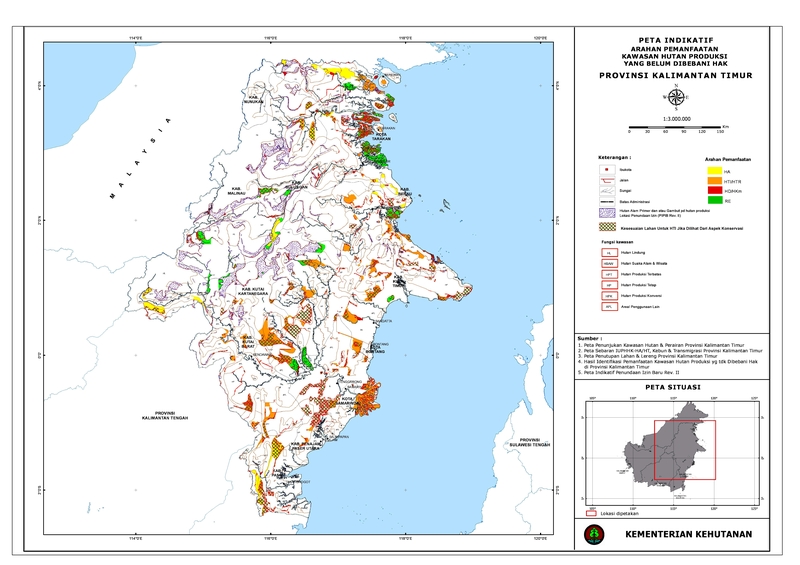 The following maps show only the area that is not in production forest concession in it of course can not be used as a reference that this region could then granted concessions in it. The following table shows the extent of the area that is not in production forest concession in them to differentiate by district. Based on the regulation of production forest is allowed to HTI or other activities by adding detailed study on the suitability. As described in the previous section that there are other considerations to identify area to be converted into a concession. This analysis was performed using data provided by looking at other aspects such as existing conditions, priority conservation areas, and a moratorium on licensing policy. 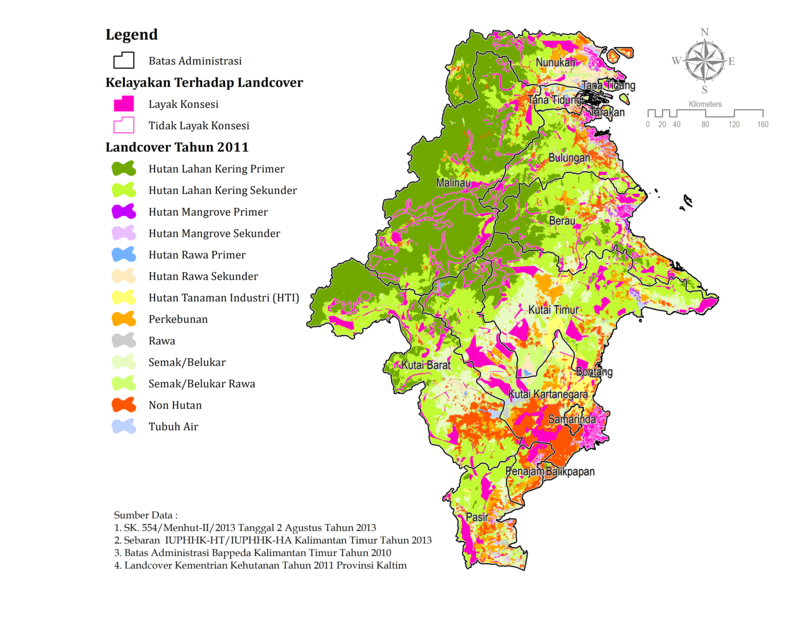 The first analysis is to look at the existing condition of land cover in the region of East Kalimantan . The analysis is used to map land cover using the year 2011 issued by the Ministry of Forestry and already published on the Ministry of Forestry WebGIS. Plantation forestry land cover identified in the year 2011 could be a concession held by the public as part of a collaboration with HTI concessions. His status was Plantation Forests that are outside the concession area. Inaccurate data, can be of the data concessions yet the data are updated or land cover that have not been verified in the field. In narrow areas, may be a fault line or withdrawal due to differences in basic data sources. On the map screenshots shown that peat and mangrove area is an area that should not be granted a new license HTI. Similarly in the area located in the eastern part has been determined to be the most protected areas and areas that still have a good forest cover is recommended to not be converted to the new forest concession permits. 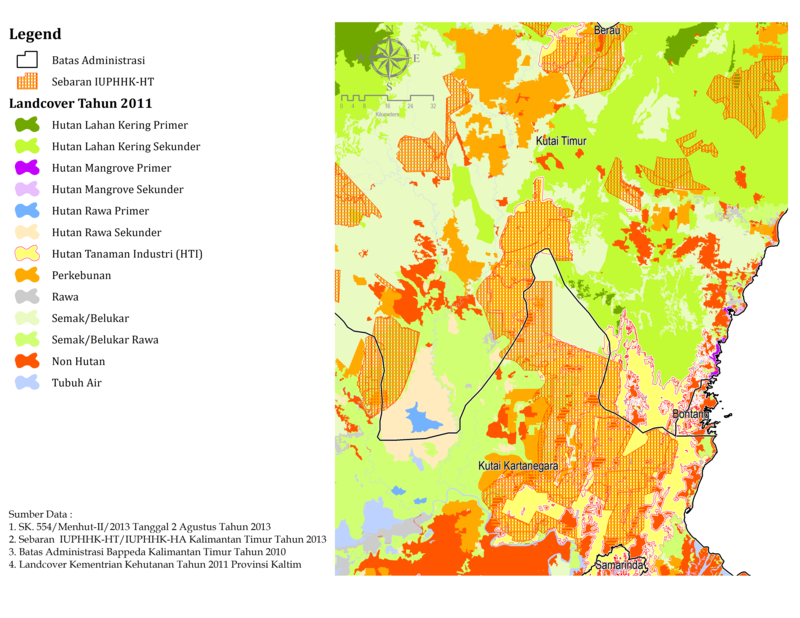 Further analysis is to use a distribution map of orangutans that have been done by TNC and OCSP. The analysis revealed several areas that serve HTI is the habitat of the orangutan area. 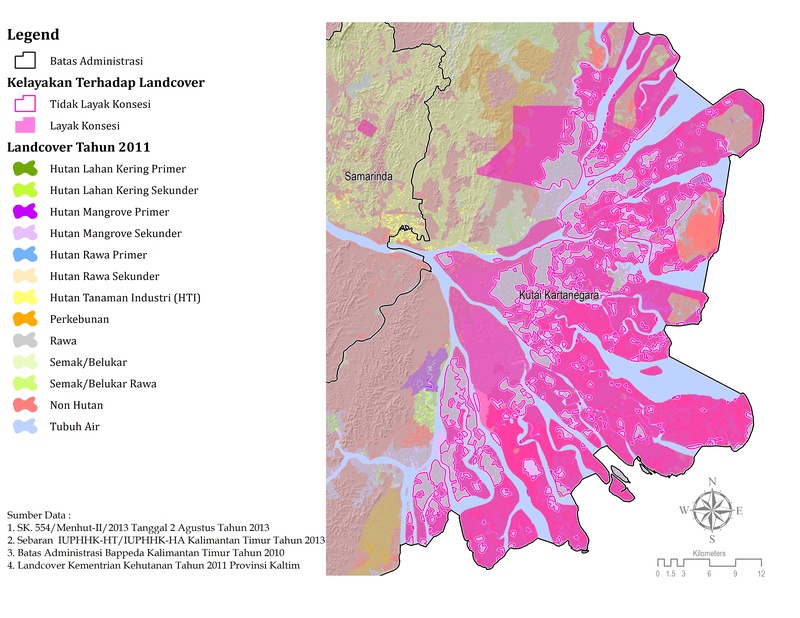 TNC conducted an analysis to prioritize conservation areas in East Kalimantan, the analysis is conducted to determine priority conservation areas by ecoregion approach. Maps generated in the analysis of Eco-Regional Planning or ERP describe areas important for conservation have value and deserve to be protected from conversion. Using these data then overlaid with ERP analysis to show that there are certain areas of production forest areas need to be protected as conservation factors. With this basis the region once identified as an important area in the analysis The Eco-Regional Planning (ERP) should be excluded from the proposed production forest that can be converted into concessions (including concessions HTI). From the analysis it is known that the production forest that can be converted into a concession is very little. Map below and the total area of ​​the region (in Ha) if displayed in the following table. The results of the final analysis are shown in the table where in it has also been reduced by orangutan habitat, the area becomes less as shown in the following table. As summary that TNC analysis only recommended area that can be converted into forest concession in East Kalimantan only 943.868 hectare. Latest ministry of forestry policy through Ministerial Decree No. 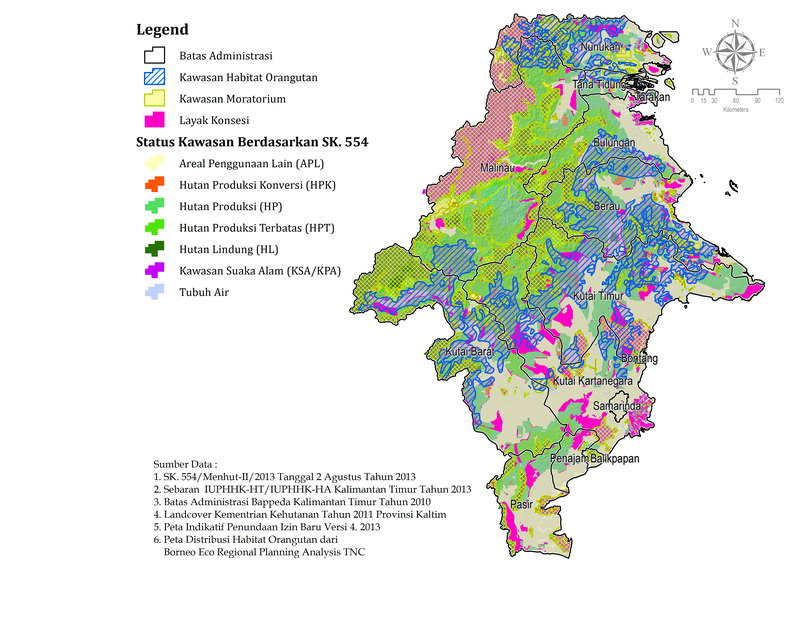 5040 in 2013 about indicative maps for designated areas for forest conversion, where this regulation reserved for East Kalimantan concession is 1.299 million hectares. Overlay between indicative maps by government and TNC spatial analysis shown below. Existing plantation concessions in East Kalimantan region should be studied further because there some timber plantation overlaps with the non-forest areas and or protected areas. 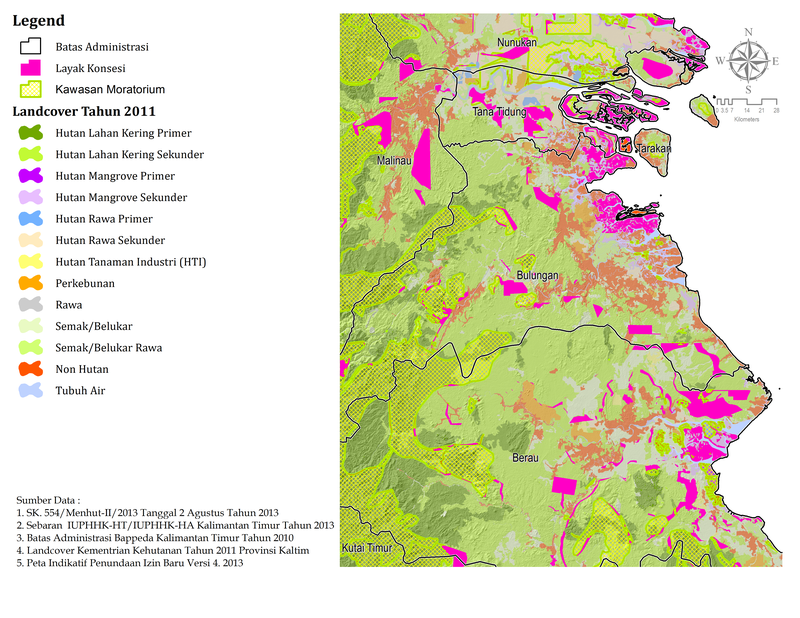 The area in indicative maps by Ministry of Forestry regulation no 5040 year 2013 supposed to delineate less than in indicative maps, some areas that look appropriate category based forest proved to be a very important area for conservation by considering orangutan habitats, ecoregional plan and with other data such as carbon stock. More in-depth analysis is required to determine the production forest areas that are not productive. This analysis can be performed with high-resolution satellite imagery and ground check on the locations to be converted before permission is granted management of the site. Transparency needed related to spatial data in forestry, some newest regulation on forestry should be able to download through web and used properly in forestry sector planning and activities. As forestry activities that should do the planting in the context of the need for timber , the timber should be well planned in accordance with the conditions of the available land . Land suitability analysis could be an option to be part of the initial plan proposed concession . One aspect that is important to do is to conduct a study on land spesific based on the physical aspects of the area and the type of plants that will be proposed in plantation activities . HTI consists of a wide variety of plants that can be developed , one type of plant that was developed for plantation timber as a raw material powder / pulp is acacia mangium ( Acacia mangium Willd ) . Rainfall of 1,000 to 4,500 mm and the amount of rainfall between 1,446 to 2,970 mm . Detail report in word document can be download with link below. This entry was posted in Uncategorized and tagged East Kalimantan Timber Plantation, HTI Study, HTI Study East Kalimantan, Spatial Analysis Timber Plantation, Timber Plantation Indonesia. Bookmark the permalink.